Today I'm honoured to welcome Christine Rains as part of her blog tour for 1301 - The Marquis, the first in what looks like a really exciting series of supernatural novellas. She's here to talk about those characters we love to hate (or hate to love) - villains. So without any further ado, take it away, Christine! Villains. Some of the most memorable characters in fiction are of the evil variety. Dracula, Voldemort, and Captain Hook. Their hypnotizing eyes and maniacal laughs. You know them as well as the heroes, and sometimes they're even more famous. It's been their sinister plan all along, of course. In The Marquis, the hero Marc pits himself against a trickster demon named Vetis. Vetis isn't afraid to get his hands dirty, but he's not at all stupid. He's not bulging with supernatural muscle nor eager to crush everything into rubble. He has minions for that. What makes him so dangerous is his skill with illusions, his keen mind, and his vicious tongue. He could convince someone to hang herself and not lift a finger. Unless he's doing so through a text message. Vetis is introduced as a mid-level demon forced to do boring work like tempting a vampire to sup upon a drugged teen. There's no fun in a job that offers no challenge. So when Marc steps in to save his vampire friend, Vetis sees his chance to torment one of his former comrades and rise up in the ranks of Hell by bringing back the head of the infamous Marquis. It's easy enough to insult Marc's beard and bad wardrobe, but Vetis doesn't just want to kill him. He wants him to suffer before he takes his head. How to do that? Find out what matters to the old demon: his city, his friend, and his lady love. There's nothing sacred to Vetis. Nothing is more terrifying than an enemy who has no conscience and likes to flaunt that fact. His wit is more deadly than a sword. He'll get what he wants in any way it takes. Vetis' plan might lead to the destruction of everything Marc holds dear and then Marc will welcome the fate Vetis has in store for him. Villains like Vetis push heroes to their every limit and then beyond. Sometimes they even win. And the trickster demon believes he has his victory in hand. 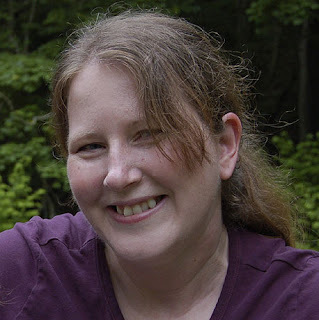 Christine Rains is a writer, blogger, and geek mom. She has four degrees which help nothing with motherhood, but make her a great Jeopardy player. When she's not writing or reading, she having adventures with her son or watching cheesy movies on Syfy Channel. She's a member of S.C.I.F.I. The 13th Floor series is her first self-published series. She also has two novellas and sixteen short stories published. Congratulations, Christine! I'm looking forward to reading this and the rest of the installments! Once again I'm reminded no story suffers from too simple a hero or too complicated a villain. Rollicking good example! My compliments. Vetis sounds like a fantastic villain! I've always been a fan of the kind that rely more on brains than brawn. Those villains always come across more menacing to me that way. His wit being deadlier than a sword is such a clever way to phrase that! Well, he sounds horrifying! Great post! Villans with a dark past, who have a reason for what they're doing, especially if they believe is actually for the good, are the best:) Huge congrats Christine on the launch. Sounds like one mean villain! Geo, great example! Thanks for commenting. Heather, I've always loved that sort of villain too. I like when they sit there talking and you think what they say makes perfect sense. It's frightening when you can see the logic in a villain's point of view! Tania, oh yes! The villains who believe they're doing good are terrifying. Thank you very much for hosting me today, Nick. This is a lot of fun! Congrats to Christine on her release. By the sound of of it 1301 has some strong characters. I love me a good villain. Congrats Christine! Hi Nick and Christine .. I don't much like the sound of Vetis .. I'm not good with the bad guys - on the other hand we have to have them .. to get the book to work! J.L., thank you! Strong and stubborn! Hilary, Vetis is a nasty fellow, but we have the heroes to save us! Thanks! Vetis sounds like a very cool villian. Thanks, Sherry! He was so much fun to write. Good versus evil...evil vs less evil, they make for good storytelling and grabbing your attention. Not to mention making you choose sides! Hey Nick, Shannon Lawrence over at the Warrior Muse and I are hosting an Apocalypse Blogfest next Friday. We'd love for you to attend. Like the sound of this paranormal romance. Thank you, Cherie! Voldemort is one of my favorites too. Another fun post in this blog tour! Congrats to Christine. Wow, the description of your villain Vetis is enough to have me hooked. (: Congratulations with your release and I wish you lots of success with it. Now I'm off to add this to my tbr list! I do love me a good villain! I always admire people who can write a compelling one. Elise, thank you! I'm glad Vetis could tempt you. Julie, thanks! I think it's one of the best parts of being a writer. Misha, I love villains like that too. They're far more dangerous when they think they're the good guys! Vetis sounds like a great villain. One of my favorites is Darth Vader, he's just soo cool. Congrats on your new book! I like writing the villain, even though mine are not of the supernatural variety. Not sure of my faves. Maybe Cruella de Ville or Darth Vader. I've seen Christine's book around. That is one scary cover! Lynda, yes, he does! Thanks for popping in. kmckendry, Darth Vader is a great choice. One of my husband's favorites too. Carol, thank you! Another Vader fan. Congrats to Christine. I love the cover intrigue and that villain sounds really cool. Happy Holidays Nick. I hope you have a wonderful New Year! I'm a big fan of Christine's, and Vetis certainly seems like my kind of nasty! :-) Awesome cover, too! I wish you well with Marquis, Christine!